This week, I thought I would discuss the characters mentioned in last week’s post in more detail. Some readers did not recognize the characters. Others did not see some of the characters in the same light and left scratching their head and wondering who could admire such a monstrosity. So, here is a more in depth description of the four characters mentioned in last week’s post and an explanation of why I admire them and why I feel they are characters who inspire us to be the best that we can be. Nausicaa is a princess of a small valley kingdom that flourishes because it has fresh winds when everyone else is plagued by winds filled with a poisonous miasma from the Toxic Jungle, a giant jungle filled with immense, gigantean insects. Most humans are afraid of these insects, but Nausicaa treats them with love and kindness, and they respond to her accordingly. When war comes to her part of the world, Nausicaa takes a stand for peace and does everything she can to keep the various sides from fighting. However, she does not hesitate to fight herself when it is called for. This mixture of a strong and determined stand for peace with an active person who is not afraid to fight is I find tremendously appealing. Her strength of character, her determination, and her absolute bravery are the qualities that recommend her to me so strongly. 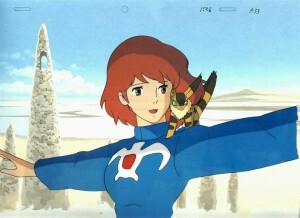 My all-time favorite scene in any book or movie is the one in this film where Nausicaa stands up on her cloudclimber (think ‘sideways, flying, surf board with jets’), spreads her arms, and flies straight at a machine gun in order to save a baby insect (think a bug the size of a tank) and, ultimately, her Valley. She faces death with such bravery and determination and, even after she is wounded, does not even hesitate in her attempt to save the baby insect, even when doing so pushes her wounded leg into a lake of acid. The scene is made more poignant by the fact that, due to earlier events in the plot, our heroine is wearing the robes of a dead princess from another land—the land the gunboat comes from. The gunner looks up through his site and freezes because he thinks he is shooting at his dead princess. This does not keep Nausicaa from getting shot, but it does make it so that her injuries are not as severe as they might have been. I have seen that scene many, many times. It never fails to cause my heart to swell, and my thoughts to pause as I contemplate all that is good and brave in the human character. Kenshin is a wandering samurai, a ronin, in the Meiji period of Japanese history (late 1800s). Following a terrible war, the Meiji government decided to put a stop to the old ways and outlawed swords and swordsman. In the story, many former samurai have put aside their weapons but rogue swordsmen remain scattered across the landscape, causing trouble. Kenshin stands out from these troublesome swordsmen in two ways. First, he uses a sakaba sword, a sword that is blunt along the hitting edge, which is meant for bludgeoning instead of slicing. This allows him to fight without slaying his enemies. Second, he is a better swordsman that everyone else he meets. Turns out, Kenshin was once the Battousai (translated: Manslayer), the most deadly swordsman of the previous war. At some point, however, he became disgusted with his life and vowed never to kill again. Like Nausicaa, Kenshin is a pacifist who is willing to fight to defend others. (Yes, I am aware that there is a pattern here.) He is lighthearted and rather goofy, until trouble strikes. Then his superb skills and his fierce determination come to the fore, and he rises to meet the challenge. He is also intellectually astute. When his enemies seem more than human, he studies them and is often able to defeat them because he has figured out the trick they are using to give this impression. The drama in Kenshin’s story comes from the attempt of other swordsmen, especially those who would like to increase their reputation by defeating the famous Battousai, trying to force him to break his vow. At times, the pressure on him to break it this once and kill some particularly villainous enemy is tremendous. Yet, despite the temptation to backslide, Kenshin prevails. He remains true to his vow. His strength of character and his convictions are so impressive that many of his former enemies are won over and becomes allies. By his actions, Kenshin demonstrates that it is the spirit, rather than the body, that wins battles. When I watch Kenshin, my determination to stand on my principles increases. Monkey D. Luffy is pirate made out of rubber. Now, I realize that this sounds a bit different from our two pacifist heroes mentioned above, but bear with me. Luffy lives in a world lousy with pirates—huge, hulking, evil guys who prey upon the innocent. As a young boy, he vows that he will become the King of the Pirates, and, as our story starts, he sets out to do just that. But Luffy, whose brain is also made of rubber, does not seem to grok what the word pirate means to everyone else. While he calls himself a pirate, he has yet to do a single pirate like thing. So far, in fact, the main thing he and his crew (whom he describes as: a swordfighter, a navigator who loves maps, a liar, and a reindeer) have done is fight pirates. The impression so far is that if Luffy ever does end up as the King of the Pirates, it will be because defeated them all and put an end to their villainous ways. 1) He has a dream—to become King of the Pirates—and he does not allow anything to daunt him, despite how unrealistic that dream might seem in the face of the odds against him. 2) He respects the dreams of others and urges them to follow their dreams as well. 3) He never gives up or becomes daunted. 4) He is utterly loyal to his friends and never fails to defend someone in need. Like with Kenshin and Nausicaa, a great deal of Luffy’s appeal comes from his sheer determination, his unwillingness to allow what he perceives as an injustice to stand. He is a goofy, easily distractible fellow with no lack of faults, but when things get serious, he is as reliable as the rising sun. He will prevail and save his friends. It is these quality that makes him stand out to me as an inspiring character—watching him, I find myself inspired to try harder and to be less daunted by the obstacles life throws at us. Harry Dresden is the only practicing wizard, or at least the only one who advertises in the yellow pages. He is a rag-tag, noir-style hero, who constantly skirts the line between morally-ambiguous and downright wrong. And yet, he often shows great strengths of character. He refuses to give up, even when egregiously wounded. He stands up for his friends, for innocents, for what is right, even when it is blatantly obvious that doing so is going to dunk him into so much hot water. He is also, in the words of one character, diplomatically-challenged. His perchance for snideness in the face of authority adds much drama and amusement to the series. However, Dresden differs from the other characters described here in that he can be daunted. He is a much more tattered, less pure character, who does occasionally give in to the pressures of life. He breaks more often, compromises more than that other three. So, why did I include him? Because it is my impression from the story thus far (I realize the series is not over, and I could turn out to be wrong) that Dresden learns from his mistakes. Many characters is series, especially series with a grunge factor common in urban fantasy, noir detective stories, and some TV shows, participate in a downward spiral. As the series progresses, the character becomes more edgy, more willing to do the dark thing, less virtuous. Very few of these characters reverse their downward spiral. Very seldom do we see them acknowledge their mistakes and attempt to right what they have put wrong. Face it, Folks, most of these characters are never coming up again. Much as I would love to see it, there probably will never be a plot line where they wake up one morning, realize their mistakes, and decide to straighten out their life. In these stories, virtue is considered passé, unrealistic. How dark and gritty you are willing to go is the standard they shoot for. When Harry Dresden picked up a coin containing a fallen angel and began down one of these spiral paths of moral destruction, I stopped reading the Dresden Files. But I did not stop following it. Each time a book came out, I got a report from a good friend as to how Harry was doing. Was he getting worse? Had the series gotten darker? That, I loved! Here, finally, was a guy who did not throw in the moral towel just because he had gotten it dirty. So, I now am willing to give Butcher the benefit of the doubt. I think Harry made some serious errors in Changes, but I am still hoping that he will recover (though probably not in the next book or so), that he will acknowledge some of the errors he has made and try to dig his way back to the light. It is this quality—the refusal to surrender to the darkness, even after compromising with it, that makes me admire Harry Dresden so much. We all can use reminding that having soiled hands is not an excuse to continue playing in the dirt. What these four characters have in common, even if Dresden occasionally slips up, is a relentless determination to be true to their ideals despite the clamor of the world that shouts that they must do otherwise. Or if they do, as in Dresden’s case, they do not use their fall from grace as an excuse for further depredations. What these characters have is integrity. It sounds like a rather simple thing, but it sadly rare. A majority of characters do not clear enough ideals for the issue to ever arise. They have no principles to defend. Others seem to wallow in betraying any standard they might have laid claim to. It is a joy to see those who do stand for something of value, to watch characters remain steadfast in the face of terrible odds. Seeing their resolve reminds us of what is best in ourselves. It inspires us to rise up and live the best lives we can. October 7, 2010 in Wright's Writing Corner.